Dog Bite / Attack Injury – How Much Compensation Can I Claim? Britain is known for being a nation of dog lovers, with over 9 million of our four-legged friends being kept as pets across the country. Most dogs are well cared for and have good temperments, making them wonderful companions for humans, however, dogs can become aggressive if they are mistreated, neglected, or have been encouraged by their owners to attack others or if they have not been kept under correct control or supervision. In some cases humans have been victims of dog bite/attack injuries. Sadly increases in dog bites and dog attacks have risen 76% in the last ten years. Sadly some attacks involve serious injuries. Of all the accidents that were fatal, children accounted for 2/3s of the victims. The Independent newspaper reports that Staffordshire Bull Terriers, Alsatians (also known as German Shepherds), Border Collies and Labradors are amongst the top breeds for attacking postal workers. The City of Liverpool reported that in 2015, Jack Russell’s were the breed most likely to attack. If a dog (or any other sort of animal including a human) has bitten you and the bite has broken the skin then you should seek immediate medical treatment for your injury to prevent the transmission of infection. Remember, part of being a good dog owner is taking responsibility for the way the animal behaves. This includes correct behaviour training, not encouraging your dog to be aggressive (for example, raising a dog to be a fighting dog or “status” dog, making sure the dog is kept under proper control when out in public (for example keeping it on a lead) and is correctly supervised around others. If a dog has bitten you, attacked you, if you have been bitten by a dog in the workplace or bitten by a dangerous dog and the dog owner or another party was to blame then you can claim personal injury compensation from them, to hold them accountable for their actions. Dog attack compensation settlements can be worth in the tens of thousands of pounds, if your injuries are serious, so it’s well worth pursuing your claim. We are Accident Claims UK, a trusted solicitor’s firm and personal injury law advice service. We have an excellent track record of helping victims claiming for a dog attack win their compensation cases. Call us today on 0800 073 8801 to enquire about claiming compensation payouts for dog bites. One of our friendly advisors will be happy to speak to you, let you know what dog attack compensation amount you could claim and if you have a legitimate case, match you with a personal injury solicitor to fight your claim relentlessly. What Are Dog Attack Injuries? What should you do if attacked or bitten by a dog? If a dog attacks you, who do you make a claim against? Can I Claim Compensation If I Experienced A Dog Bite Or Dog Attack Which Gave Me Tetanus? Can I Claim If I Was Attacked By A Stray Dog? Can I Claim Dog Attack Compensation On Behalf Of Someone else? What Can You Claim For After A Personal Injury? Dog Bite Compensation, How Much? Why Choose Us To Help You Claim For A Dog Bite or Attack? As we have already stated, most dogs are good natured and make loving pets. However, dog bites and dog attacks do occur and can lead to serious injuries. If a dog breaks the skin as it bites you, its teeth can transmit bacteria from its mouth and cause infections, so you must seek appropriate medical treatment straight away. In some severe cases, a dog bite attack has resulted in the victim becoming severely mauled, or even killed. Even less serious dog bite injuries can cause visible scars or untold psychological damage. If you were injured due to a dog bite attack which wasn’t your fault, you could be owed potentially tens of thousands of pounds in compensation. In Britain, there is a three year time limit on making a personal injury claim. This means from the day you were injured, made ill or realised that you had been injured or made ill, you have three years in which to claim compensation. Exceptions to this rule apply if you were claiming compensation for a child. This means that if you were bitten by a dog, or attacked by a dog in an accident that wasn’t your fault in the last two years, you could claim dog bite compensation. Accident Claims Advice can help you claim the compensation that you are entitled to. Call us today for your free consultation, to be advised on the average payout for dog bite in the UK and to be provided to a top solicitor to handle your claim, if you are due compensation for your injuries. If you need to claim dog bite compensation, or dog attack compensation you can do so, providing that the accident was not your fault. Dogs, like people, are likely to defend themselves if they are threatened or in danger of being, so you cannot sue for a dog bite compensation if you provoked, threatened or harmed the dog in any manner. However, if the dog bit or attacked you because of negligence on the part of its owner or another party, you can compensation as a dog bite victim. Most dog bites are minor dog bites. These types of dog bites can be easily treated and shouldn’t’ cause ongoing medical problems. If you have only experienced a minor dog bite you could still be liable for personal injury compensation if it caused you to become injured. Contact Legal Expert to enquire about claiming for dog bite injuries. We recommend you report even minor dog bites to your local warden, as it may be a sign that the dog is becoming aggressive and may pose a more serious danger to others in the future. If you compare the years 1997-1998 and 2007-2008 the number of hospital admissions to dog attacks, or “collisions” with dogs doubled. You can also see older people are more likely to be injured by a dog then they were in the previous decade. One possible explanation could be that Staffordshire Bull Terriers have been taken off the dangerous dogs’ list. “Bully breeds” were originally bred for the cruel sport of bull baiting, so, unfortunately, don’t have the inhibition against attacking creatures larger than themselves that other dog breeds have, so are more likely to attack older children and adults. The information below is legal advice. It goes without saying that you should seek the appropriate medical treatment immediately if you attacked, bitten, or in any way harmed by a dog. This is especially the case if you have serious injuries. If you, or someone else is severely injured by the dog you should call an ambulance. There are things which you can do at the scene of an accident, it bitten or attacked by a dog, which can help your case when you are claiming for dog bite injuries, further down the line. Firstly photograph your injury, including the date stamp if you can. Note down all of the details you can observe about the injury you can at the time, as its surprising what details you can forget later on. Talk to any witnesses and get their contact details as they may be required to give evidence to support your claim, if you sue for criminal injuries compensation in regards to your dog bite. If it is possible, exchange contact details with the dog’s owner as well. All of this information will help your solicitor collect usable evidence to support your personal injury claims case further down the line. What Is The Dangerous Dog Act 1991? The Dangerous Dogs Act of 1991 bans four breeds of dogs from being owned in the UK. This includes the Dogo Argento, The Pit Bull Terrier, Japanese Tosa, Dogo Argentino and Fila Brasileiro. All of these dog breeds are fighting breeds with incredible jaw strength. Dog fighting has been banned in this country for almost 200 years but unfortunately it still goes on. Not only are these dog fights incredibly cruel but the dogs are often abused and encouraged to be aggressive and vicious as part of their “training”. This is not just cruel towards the dogs, it also encourages aggression which means that they’re more likely to attack humans. The Dangerous Dogs Act of 1991 bans the owning, sale, exchange and breeding of these dogs. Anyone who owns one, has to have their dog assessed and the dog may be destroyed if it is not deemed safe. Breed Specific Legislation, such as the rules of the Dangerous Dog Act, is a controversial subject within the dog owning community. The RSPCA for example, is highly critical of breed specific legislation. In the UK dogs have to be registered and dog owners have a legal responsibility to keep their dog under control. If their dog attacks another person in an unprovoked attack, the owner is held responsible. If the dog attacks an intruder, or is attacked by another dog and defends itself, then the owner is exempt from responsibility. 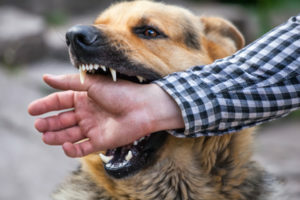 If you are the victim of a dog bite or attack then it is crucial that you hold the owner accountable and make a dog attack claim, as well as seeking an insurance payout for the dog bite. Claiming compensation as a dog bite victim is not only important as for your own sake, but to ensure the law is upheld. You can claim compensation for a dog bite you suffered at work. Under what circumstances might you suffer a dog bite at work? If you are a veterinary nurse or vet you may have been bitten by an aggressive dog. If you work in security, you may have also experienced a dog bite attack from a working security dog. In this case you would claim dog bite compensation. If you are bitten by one of the four breeds of dogs that are banned under the Dangerous Dogs Act of 1991 that should increase your grounds for claiming for dog bite injuries as the owner has already broken the law. Trust Accident Claims advice to help you claim dog bite compensation in the UK. We have a successful track record of winning compensation claims like this and ensuring the victim receives the maximum amount of compensation possible. The average dog bite claim involves claiming criminal injuries compensation dog bite/attack, you will claim against the dogs owner. This is especially so if it was the owner whose abusive or negligent behaviour caused the dog to become violent. You may also claim against your employer if you experienced a dog bite at work (for example if you work in veterinary medicine and your employer did not take proper precautions to protect you). Sadly, children account for the majority of people attacked by dogs are children and ⅔ of dog attack victims that die from their injuries are children. In the last 10 years, the number of people under 18 admitted to hospital in London for a dog bite attack has doubled and in the West Midlands it has increased by 80%. If your child has been attacked by a dog in an unprovoked attack, you can make a dog bite compensation claim on their behalf before they turn 18. If you do not, they will have 3 years to make a dog bite compensation claim for themselves, after their 18th birthday. The majority of dog bites can be treated easily, however if you are bitten by a dog and it breaks the skin, you should seek immediate medical attention to ensure you do not experience an infection. A rare number of dog bites will result in the victim contracting tetanus. This is a serious illness which is caused by the dog’s saliva transmitting bacteria into the open wound. Symptoms of tetanus include: sweating, a temperature of 38 degrees celcius or above, a rapid heartbeat, muscle spasms that make swallowing and breathing difficult and a stiffness of the jaw. If you experience any of these symptoms after a dog bite attack, seek the help of a doctor immediately. If you have contracted tetanus from a dog bite, this should increase your chances of claiming compensation for a higher dog bite compensation amount. Please contact Accident Claims Advice, to enquire about claiming dog attack and bite compensation. If a stray dog has bitten you it may be harder to claim compensation. If the dog’s owner can be identified then you can claim compensation payouts for dog bites from them. Allowing the dog to stray is a from of negligence on the part of the owner of the dog, so this would support your claim for dog attack compensation. If the dog’s owner cannot be identified you may be able to claim dog attack compensation from your local council, or the company that managed the grounds on which your dog was bitten, for allowing the dog to stray on those grounds. Speak to Accident Claims Advice, for help on claiming dog bite compensation when the dog was stray. Bites: bites can cause varying degrees of injuries. As we have mentioned, if your skin is broken by a dog bite, the bacteria in the dog’s mouth can be transmitted to the open wound and cause infections. The NHS recommends that you seek immediate medical treatment if you are bitten by a dog and it breaks the skin, to avoid the spread of infection. Scars: A dog bite of scratch can cause scars, including damage to the facial tissue. In serious cases, the victim may require plastic surgery. This, of course, can affect the dog bite victim sense of self-esteem and cause psychological damage. Broken bones or bone crush injuries: If you are attacked by a large dog, which pushes you to the ground you can break or fracture a bone upon impact with the ground. Head or brain injuries: If the dog attack victim hits their head because the dog pushes them over, or the dog bites them on the head, this can cause brain injuries or head injuries. Psychological damage: Being attacked by a dog can be a terrifying and traumatic experience. Victims can develop a fear of dogs or post-traumatic stress disorder (PTSD). The victim may need extensive psychological treatment as a result. Unfortunately, some dog attacks and dog bite attacks result in fatalities. From 2014-2015 there were 21 fatalities from dog attacks. Contact us today for free legal advice on seeking compensation payouts for dog bites. If you are a dog owner whose dog has bitten someone, you may have to pay compensation to the victim. If you do not have pet or other insurance, to pay the insurance payout for the dog bite, the courts may have order you to pay the compensation for the dog bite yourself. You may only have to pay the cost of the victim’s medical expenses or fees, depending on the outcome of the court case. Please contact us today for more information about insurance payouts for dog bites, if you do not have a pet insurance and your pet has been involved in a dog bite attack. Clients often ask us if they can claim dog attack compensation on behalf of a family member. You can claim compensation amount if your next of kin was killed in a dog attack, or is unable to claim for themselves due to their injuries (for example if the attack caused brain damage). If you call us, a sympathetic advisor will you through the process of doing this. If you are claiming for dog bite injuries, you can claim for different injuries. This includes general damages where you claim dog bite attack compensation for the suffering and pain your injuries caused, the cost of medical care, additional travel or at home care you had to undergo. You can also claim compensation for loss of income if you were left unable to work for a period of time due to your injuries. If you are claiming dog bite compensation, how much you will receive will probably be a major concern of yours. Dog bite compensation amounts vary greatly depending on how severe the injury is, but the average compensation claim will be in the tens of thousands of pounds. The table below has information on dog bite compensation amounts that you could claim for your injuries. If you are claiming dog bite compensation we can give you a more accurate estimation of how much your claim is worth, depending on your individual circumstances. Loss of potential future earnings £10,000 - £40,000 Based on current pay as well as anticipated future pay. Loss of any benefits £5,000 - £500,000 Based on actual lost income. General suffering and pain £1,000 - £200,000 Based on actual and experienced pain and suffering. Mental and psychollogical anguish £3,550.00 Overall fear of death or the end of a persons life. Severe psychiatric injuries £41,675 - £88,000 There will be a poor future prognosis. Various factors will play into how this is calculated. More moderately but still severe psychiatric injuries £14,500 - £41,675 The anticipated future prognosis will be much better than the above category. Fully moderate psychologial injuries £4,450 - £14,500 The anticipated future prognosis will be much better than the above category. There will be a good degree of recovery over the long term. Milder psychological injuries £1,170 - £4,450 Settlements will take into account the effect on activities such as sleep and how long this lasts. Facial injuries including disfigurement – very serious – Women £36,800 - £74,000 There will be a large scale disfigurement and psychological injuries. Facial injuries including disfigurement – Milder injuries– Women £23,000 - £36,800 Less substantial than the category above. If you were attacked by a dog and experienced a dog bite at work, a dog bite in public, or experienced a dog bite in a private residence, which happened because the dog’s owner or your employer acted negligently, you could be entitled to claim dog attack and bite compensation. We understand that when you have gone through a traumatic experience, which may have been costly in terms of medical bills and caused you a loss of income. That’s why Accident Claims Advice offers you the option to make a no win no fee dog bite/attack compensation claim. What is a no win no fee accident claim? This means that you will only pay if you win your dog attack and bite compensation claim, so your fee will come out of your compensation payout for your dog bite. For Many claimants, no win no fee is the less stressful option because you will only have to pay your solicitor’s fee if you win, so there’s no financial risk to you. Call us today to enquire about making a no win no fee claim. Having a dog is a responsibility, not a right. If someone has been an irresponsible dog owner, which has led to you being hurt in an unprovoked dog attack, you should hold that person accountable by suing for dog bite compensation. Trust a top personal injury solicitor from Accident Claims UK to help you in claiming for dog bite injuries. Many of our solicitors have years of experience practising personal injury law and can help you claim tens of thousands of pounds for your injuries. Call us today for your free dog bite compensation claims consultation and if you have a legitimate claim, we will proceed with you case right away. Don’t let irresponsible dog owners get away with it, call Accident Claims UK to start your claim. We’re looking forward to hearing from you.